First came The Bradys. Now come The Imaginists. 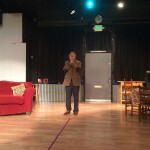 My theater critic friend, R, took me on a road trip to Santa Rosa at the weekend. I had no idea what I was in for, beyond the fact that we’d be seeing a show that Rob was very excited about. So excited, in fact, that he’d spent much of every exchange we’d had in the preceding week telling me that if there was one thing I should see in Bay Area theater right now, it was this. Now, to fully understand what R was saying, you have to know that these days he’s quite down on the Bay Area theater scene. Pretty much all straight drama being produced these days around here sends him into an angry diatribe about lazy companies and somnambulant audiences. So to hear such a theater naysayer talk so passionately about The Imaginists, a scrappy, Santa Rosa-based company that produces experimental shows in a storefront theater an hour’s drive north of the city, piqued my curiosity. And by the time we emerged from that evening’s performance of “SitCalm!” I was raving as much as R was. Although I’ve been away from the Bay Area for the past two years, I’m ashamed to say that I had never heard of The Imaginists before I left town, even though they’ve been around since 2007 at least, by the looks of the company’s website. Judging by what I can find online and the one performance I’ve witnessed first hand, The Imaginists’ work is more akin to the sort of theater produced by experimental performance art ensembles in places like Berlin, London, France and Moscow than most American companies. They seem to do mostly original pieces (such as “SitCalm!”, the one I saw last night, which was based on the American sitcom tradition) and adaptations, (e.g. “The Wizard of Oz). However, the ensemble has also made occasional forays into more traditional plays like “Waiting for Lefty.” Though I expect that there was little that could be deemed traditional about The Imaginists’ take on Clifford Odets famous agit prop drama. “SitCalm!” is a totally warped take on sitcom tropes. The performance on Saturday was the culmination of a run that has so far featured four episodes of the series. The company calls this work “made for theatre TV” and the action — just like on many classic examples of the genre — revolves around a big, messy, American family. One ancestor, I guess, is The Bradys from the “Brady Bunch” sitcom series of yore. The teenaged (or thereabouts) kids are all of varying ethnicities and personalities — one is sporty, another is nerdy, a third is so eccentric he wanders around in nothing but a diaper and talks mostly in barks and grunts. Their parents are mostly absent. They wander in and out like Deus ex Machina. They are sort of loving and sort of detached. A lot of scenes involve the brood sprawled out on the couch watching TV. And every time someone utters one of the many zingers smattered throughout the play, there’s momentary canned applause. At one level, “SitCalm” critiques the vapidity of sitcom culture and its grand emptying of Americans’ brains. At another, the piece provides an interesting metatheatrical window through which to understand the dynamics of this unusual company. The astoundingly committed young cast members all use some version of their own name for the character they play, e.g. Rachel Quintara’s character is called Rae; Hana Casita goes by Hana etc. And the mom and dad characters are played by the company’s directors and founders — Amy Pinto and Brent Lindsay. Rob tells me that most of the young actors pretty much grew up with The Imaginists; Lindsay and Pinto are to a degree second parents to these kids. 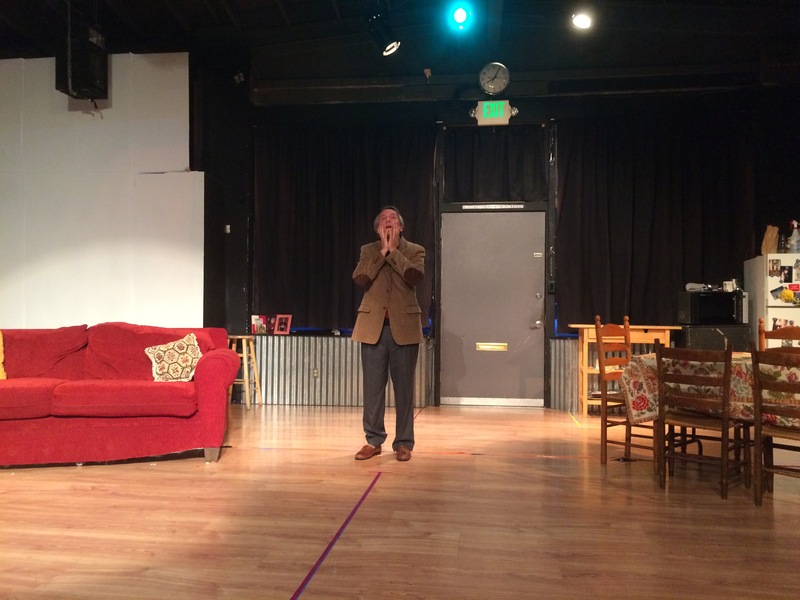 So in this way “SitCalm” plays out the fascinating dynamics of a theatrical family living in Santa Rosa. I don’t know if The Imaginists will be doing more episodes of “SitCalm” any time soon. I certainly hope so. I’m hooked.